A man in his forty’s, nostalgic of his high school years, invites four of his friends over in a cottage. As they discuss about the past and what they became, they start to tell each others scary stories. 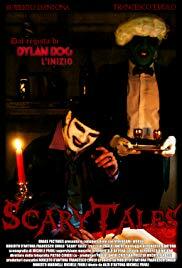 Scary Tales is a compilation of independent short stories told around a “backbone” story. I will start by saying that I am not a fan of such accumulations, which usually breaks the flow of a movie and hide a lack of inspiration of the writer. This said, Scary Tales’ stories are surprisingly entertaining, all of them being very different, with their own goods and bads. The first story is easily the best one, short and efficient. The actors played a very convincing game and the villain is a truly scary character. Another story that I enjoyed is a horror-comedy featuring poker zombies. The funny music and the innovative theme amused me a lot. In another tale, there is an awesome scene with a disgusting stepfather, who is one freaky dude! That was for me the highlight of the movie, the multiple close ups made this scene really oppressive! The second part of this story, however, failed at surprising me. The character of the freaky mum is cool however. The liked the last story to a lesser extent. It manages to build a decent story around the local myth of a cursed bridge, but features too many dialogues as compared to the action itself. Returning back to the backbone story in between the tales was a frustrating experience (but inevitable I guess). Luckily, the ending, despite being predictable, is great and leaves a really good impression to the viewer! Considering the budget “Scary Tales” was made with (6000$), I would recommend it! I would have given it a 7/10 if I was to consider the budget. However, Scary Tales rating rapidly dilute to the near average grade when compared with the ocean of high-budget horror movies.